A Twin Bed…for Two? – Where is Lydia? The next day, I packed my stuff and trekked on over to meet my Couchsurfing host, Efrain. We had decided to meet at a supermarket close to his place then walk to his house together. When we got to his home he gave me a tour of the small one-bedroom turned two-bedroom home he shared with two friends. His room had previously been the living room. He opened the door to his room and said that this was the room we’d be sharing…there was only a twin bed. I thought oh my God, what have I gotten myself into?! This guy seemed so nice and sweet and had good reviews on Couchsurfing but he wants us to share a twin bed?! I thought I’d spend the day with him before jumping to any conclusions and freaking out. He also only spoke Spanish so with the language barrier I didn’t know how to phrase it. Right as we were about to step out for lunch it began to downpour. We had to step back inside and wait it out. I was able to not only hit Cuba’s rainy season but Mexico’s as well. Lucky me! After about an hour the rain finally let up. Just as we were about to step out the front door the downpour started again. So we waited. After two hours we were starving and it was looking like we were finally in the clear. Efrain suggested we go to one of his favorite places. It was an amazing Mexican restaurant that specializes in antojitos (appetizers). The restaurant was insanely cheap and delicious! I got a giant quesadilla, an empanada, a sope and an agua fresca for only $50 MXN (about $1.50 USD) I would highly recommend going here. Agua Frescas are very popular in Mexico and can be found at most restaurants. They are made by mixing fruit with water and sugar – they come in every flavor from cucumber and lime to oatmeal (sounds gross but anything mixed with enough sugar is good). After lunch, Efrain and I headed back to his place. He had a salsa lesson to go to and a guy from Italy I had been talking to on Tinder kept harassing me to meet up. Efrain and I agreed we’d reconnect after his lesson. I met Giuseppe and his friend Nico at an Italian pasta place. They said they usually never eat pasta outside of Italy but the owner of this restaurant was from Rome and his pasta was truly amazing. Giuseppe and Nico were total characters. They had the perfect stereotypical Italian accents. At one point Giuseppe even said, “And I said a mamma, what’s with all the Jesus stuff?” using lots of hand gestures. I started telling them about my host and the twin bed situation, asking them what I should do. They agreed the whole thing was very weird and offered me to stay at their hotel if need be. After his salsa lesson I had Efrain come meet up with us. Giuseppe had been wanting to have a mojito from this mojito bar that presses their own sugarcane. After spending about 10 minutes with my host they both agreed he was a really nice guy and I shouldn’t be worried but their hotel room was still an option. When Efrain and I returned back to his home we went into his room. I was like okay…moment of truth, he pulled down a hammock that had been hanging on one wall and attached to a hook hanging on another. He said okay you want the hammock or the bed? I sighed in relief and took the bed. Las Quekas: the only thing on the menu is quesadillas and sopes. Both cost $15 MXN (about .75 cents USD)and you can get full for only $1.50. El Rincón Chipaneco: they have seriously every Mexican dish you can think of. I recommend filling up on small plates by ordering sopes, tacos, or quesadillas. You can get full and have a freshly made juice for under $3 USD. Located on Calle Jupiter Sur. Burrito Amor is definitely not Mexican but more of a fusion between gourmet American and Mexican. A little on the pricey side but definitely worth it. You can even get coconut flour tortillas if you’re gluten intolerant. Expect to pay around $10 USD. Burrito Amor is located on the main Chetumal – Cancún Road right where Avenida Tulum ends on the corner of Calle Sol Oeste. Trattoria Romana is located on the main Tulum Avenue. I didn’t personally eat here but two guys from Italy raved about it so it must be good! 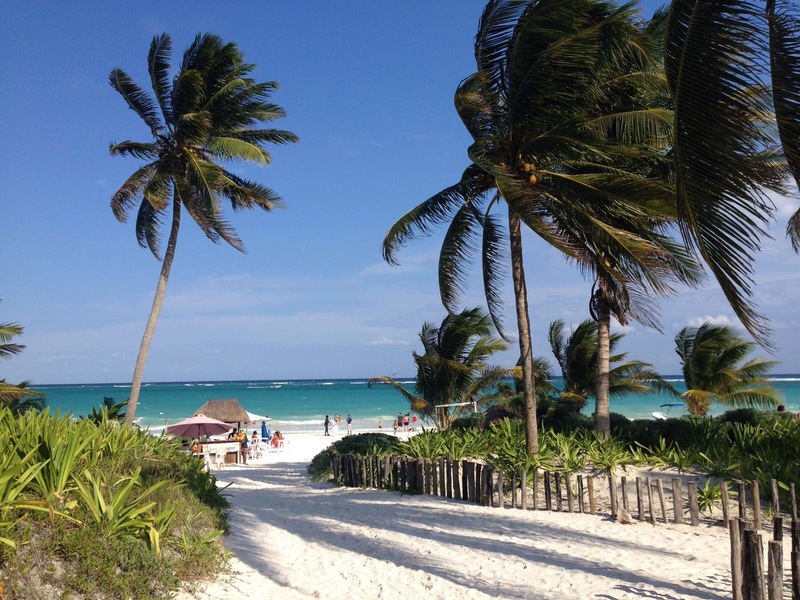 The address is Avenida Tulum 30. Campanella Cremerie has the best gelato I have ever had in my life. The owner is Italian and her brother makes the gelato. He even won second place in a gelato competition in Chicago. One scoop is $35 MXN (about $1.75 USD). Located on the main Tulum Ave close to the ADO bus station. A scoop of delicious gelato from Campanella. There is a vegan ice cream truck called Las Bolas de Postre located on the road that leads out to the beach. They make the ice cream right before your eyes using a traditional Thai method. You choose 1 to 3 flavors from their list of about 30 ingredients then they mix it together with coconut milk in a round metal container that turns it into ice cream.